Mary Ann Faulkner, new owner of the local purveyor of the indoor-grown mushrooms, has expanded farmers market sales and keeps her focus on education and serving her customers. Follow The Urban Mushroom on Facebook. Find Mary Ann at the Fulton Street Farmers Market every Friday and Saturday. Mary Ann Faulkner, new owner of The Urban Mushroom, is regarded as the “Rocker Mushroom Chick” by her customers at the Fulton Street Farmers Market. Little do they know, she actually has years of experience not only in the food industry but in the music industry as well. Her venture into farmers markets started eight years ago, when she started growing heirloom tomatoes. When she first moved here, she noticed a void in the market for available quality tomatoes. So she grew them herself. That grew into a full blown produce stand for the next seven years. When blight struck her tomato crops two years in a row, Faulkner knew it was time to move on. Having always been a fan of mushrooms, this past spring she took it upon herself to learn all she could this fungus. 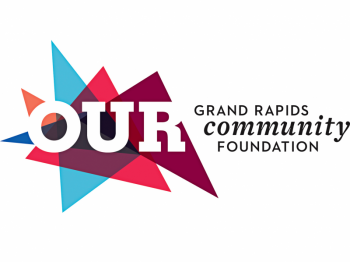 As Grand Rapids has been experiencing a quiet food revolution, with a growth not only in diversity of food choice as well as a demand for whole natural foods, local farmers and entrepreneurs have been making use of the temperate climate and plentiful rainfall in West Michigan. The region has long been a source for fruits and vegetables, and recently a new food option has opened up for food lovers to try: mushrooms. 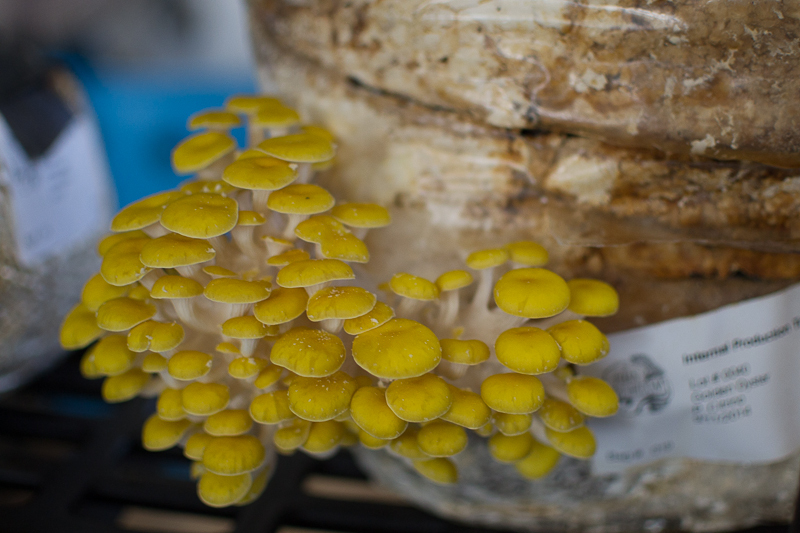 Last spring, The Urban Mushroom premiered its mushroom CSA and began offering its members high quality organic mushrooms at restaurant prices, and selling to restaurants. The founders of Urban Mushroom taught Faulkner all about growing mushrooms and in exchange she taught them all about the value of the farmers market. Through developing their business at the farmers markets around town, she quickly became the face of the company to many local customers. Faulkner’s level of commitment was tested this fall when through a turn of events the business became solely hers. Jumping in head first as the sole owner and employee, she has experienced nothing but growth. Faulkner has built relationships with more and more restaurants around town who have become repeat customers. Her level of consistency and dedication to her product is key. Faulkner sells her mushrooms not only at the farmers market, but also through Relish Green Grocer, Farmlink, West Michigan Co-op, a winter CSA as well as from her brick and mortar growing room. Often, what her new customers want to chat with her about are the three regular questions: Are mushrooms poisonous? Are they psychadelic? Do you have morels? Faulkner, now a professional grower, says they answers are more complex than yes or no. The majority of mushrooms found locally are not poisonous, although she says people should not eat mushrooms they are unsure about and learning to identify mushrooms is definitely a skill. 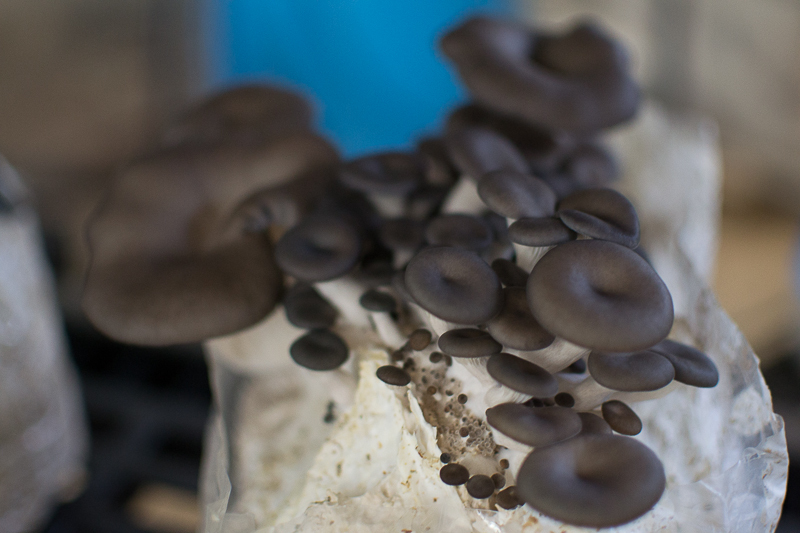 The mushrooms for sale via The Urban Mushroom, however, are grown organically from identified spore in a proprietary mix that can include a variety of ingredients including sawdust, cottonseed hulls, or coffee grounds. Growing mushrooms to maturity is a three-month process that requires regular misting - three times a day. Faulkner uses a backpack mister and is up at 2 A.M. every day to make sure her mushrooms have the moisture they need to grow. As such, Faulkner knows exactly what her product is and what went into it; it’s not poisonous or psychedelic, and currently it isn’t morels either- she says with a certain glimmer in her eye. A woman with a vision, Faulkner strives to educate more people about this superfood. 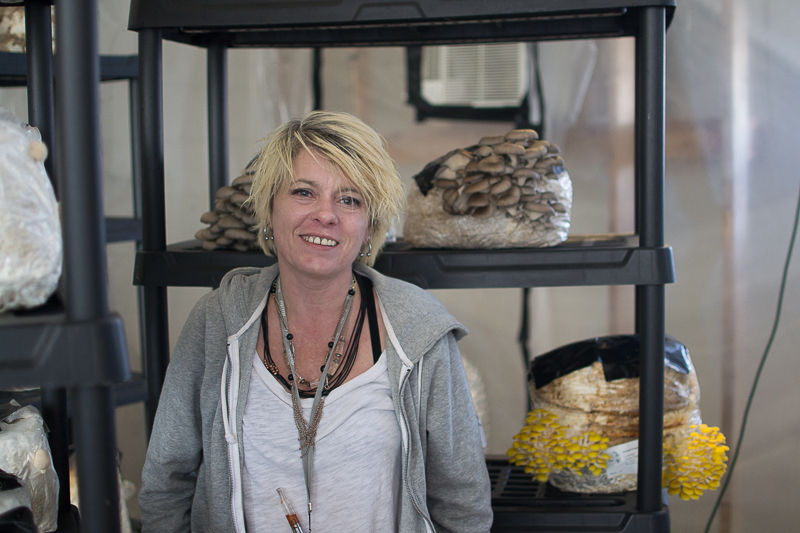 She prioritizes her goals as for The Urban Mushroom as: education, promotion and sales, putting community outreach before profit because she wants to share her love for mushrooms with others. Being the only mushroom grower in West Michigan, she is ahead of the curve. Currently she grows a wide range of mushrooms such as oyster, maitake, lion’s mane and shitake mushrooms. Since the mushrooms are grown indoors, Faulkner can provide Grand Rapidians with mushrooms all year round, which is practically unheard of in the Midwest. For those who forage for wild mushrooms, the season only lasts from spring to the early fall. Not to mention the mushrooms taste phenomenal.